RIM CEO Thorsten Heins is on the hot seat. With RIM's stock price declining and the company reporting a huge operating loss in the most recently announced quarter, RIM is counting on the launch of the new BlackBerry 10 handsets to turn things around. Heins, of course, is the one that will receive all the praise if the move is successful and all of the heat if the company burns to the ground. Heins recently sat down with Tech Crunch to discuss a few things. One thing that stands out is his determination to make BlackBerry 10 a success, Yes, he admits to being disappointed with the delay in releasing the QNX-based operating system, but he says that he will not sacrifice anything in making BB10 a fantastic experience for users. When asked to give a pep-talk to disillusioned BlackBerry fans, Heins said that BlackBerry will continue making people successful. Noting that past BlackBerry models are all about communication and helping people manage their lives, the executive said that BlackBerry 10 will take this to a higher level. Talking about email, Heins said that there are more ways of communicating today and while acknowledging that email is a core BlackBerry strength, it is only one part of staying connected. He brought up Facebook, Twitter and of course, BBM, as other ways to stay socially connected and from his comments, it would appear that the new 'Berry models will not only focus on email, but on those other methods of staying in touch. While RIM is getting BlackBerry 10 ready, it is also trying to get the large installed base in the Asia-Pacific region to upgrade from their BlackBerry 5 devices to BlackBerry 7 models, which the CEO sees as being competitive in today's market. And speaking of BlackBerry 7, Heins said his current daily driver is a BlackBerry Bold 9900, two BlackBerry PlayBooks (one for work) and a BB10 powered "ultra device" for the L-Series. There is no talk of failing in his words, only success. Only time will tell if Thorsten Heins is a visionary or overly optimistic. APRIL FOOLS!!! MUAHAHAHAHA... oh wait. But not their own company? BlackBerry is in deeps**t and no one can take them out of it. Sir your time is gone. The problem for RIM is the continued loss of market share. Every quarter brings more loss of market share. If the BB10 handsets ship at the end of 1Q2013, the sales won't be booked until 2Q2013. That is an eternity in the smartphone business. Apple will be shipping the iPhone 5 in October at the latest. More Android handsets will be shipping in October as well. The entire XMAS season is going to pass RIM by. There is a reason investors are dumping RIM stock. Wanna help Blackberry be successful? Retire. Mformation Technologies will receive $147.2 million from RIM after a Federal Court in San Francisco ruled... RIM has been in very big troubles none stop. Alright - as I just cannot help myself, I have to take the other side of the argument.... What if RIM isn't done? What if BB10 is worth the wait? What if the still large CrackBerry crowd comes out strong for BB10 after skipping BB07 (which we all know truly isn't competitive against other OS' out today)? They have large cash on hand, still strong subscriber base, a huge overseas presence, and a still heavy business and government base that refuses to leave the secure RIM servers, who are again pumping money into BB every month. And, yes, the advantages of using the same basic design on phones is that their R&D has been extremely low except for their BB10/ Playbook projects. Yes, their new sales are in the tank, they have no Cloud services to speak of, designers are more excited for WP8 than BB10. Okay, so maybe their stock and investors are tanking, and unlike Nokia they have no one to share the lose. And okay, iOS, Jellybean, and WP 8 are all going to have huge jumps on the new BlackBerry OS. And come to think of it, RIM hasn't knocked it out of park with hardware, and also is facing backlash from the carriers over their extra charges for their secure data plans, and are also not being pushed anymore than WP, and...... Wait!! I was supposed to be defending them!!!! I AM SO STUPID!!! DARN IT, DARN IT, DARN IT!!!! 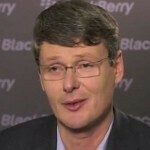 RIM would be more successful if this idiot of a CEO leave or gets fired. what the hell is wrong with the board of directors? RIM's Board of Directors need to leave along with the CEO. Actually for the first time in years, he sounds like a CEO with a plan for one, a method to executing that plan, and honesty about what is really going on in RIM. The previous two co-CEO's lacked those qualities by ignoring the iPhone, dimishing then creating tablets, and plainly saying clueless things in interviews. This guy is obviously nothing like that. he sounds like an idiot. blackberry is done for. id say by this time next year they file for bankruptcy. did you see the concept? looks really nice!